Going on a hunting trip, camping, or just an adventure? There's a multitude of things you'll need - tent, hunting gear, food, water. But what about your paracord bracelet? It's probably the smallest and easiest to carry item that you should always have on you. A paracord bracelet is not only unique and stylish. It can also save your life. They can be used to secure a splint, as a sling, trap food, tie down gear, secure a tent, and more. But what about the paracord accessories that can help you out in a bind? 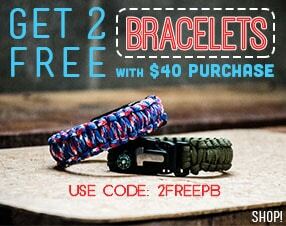 And what bracelets give you the most amount of the awesomeness that is paracord? Here, I will tell you about a couple different weaves and bracelets, and show a handful of great buckles to have when you're out in the wilderness. The most common is the Cobra weave. 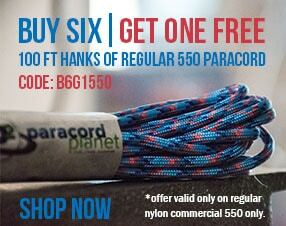 This will give you approximately 7-9 feet of usable paracord. Pictured here is our Adjustable Survival Paracord Bracelet. It's made with the King Cobra and has a flint rod and scraper for starting camp fires. This will give you over 12 feet of usable paracord! Another great bracelet to have when you're out in the wild is the Paracord Bracelet with Emergency Fire Starter & Whistle (pictured below). With this bracelet you can of course quickly and easily start a fire as well as use the whistle to alert people of your position or scare off an unexpected visitor. We also have just the Emergency Buckle available. Click here for a past blog on 6 Uses for Paracord in the Wilderness. This shackle features steel construction, three adjustment positions and an embedded compass. Click here for more info on this metal shackle. This buckle combines a 15 Lumen LED light and an all metal clasp. The Knottology illuminator's bright LED light and rugged metal body makes this a one of a kind paracord accessory for any survival situation. Click here for more info on the Knottology Illuminator Expedition Clasp. The Knottology Banshee is one of the highest quality whistles ever created. This extremely loud whistle offers a high pitch sound with very little effort. Perfect for when out in nature; jogging; or children. The 100 decibel whistle is the first of its kind with its sleek design and all metal construction. Click here for more info on the Knottology Banshee Expedition Clasp. The Guardian Expedition Clasp serves a dual purpose as a clasp for a bracelet and a storage compartment. Store medicine; sewing supplies; contact information; iodine tablets; fishhook/line; flint; earplugs; a small blade; and other similar like. Put 5 Iodine tablets in the Guardian and have access to over 96 oz. of clean water. Put flint inside the compartment and have the tools for a fire on your wrist. Click here for more info on the Knottology Guardian Expedition Clasp.